It was 62 years ago when the first president of the Maldives returned from overseas to find he had been usurped. Mohamed Amin Didi was immediately taken into detention before further intrigue and conspiracy among the country’s elite resulted in his violent death just weeks later. In the decades that have followed, the tiny atoll nation has changed almost beyond recognition. The capital of Malé has become a bustling metropolis of high-rise buildings, whose population dwarves that of the entire first republic. The country’s economy was transformed under its second and third presidents from bare subsistence on fishing to comfortable prosperity via luxury tourism. After international investigators confirmed the growing suspicions that the explosion was more than a mechanical fault, Malé’s political rumor mill – in fine working order despite years of overuse – slipped effortlessly into overdrive. Intense speculation regarding Adeeb’s involvement soon prompted a public denial from him. But Adeeb’s eventual departure to China on official business felt more like a trial separation. 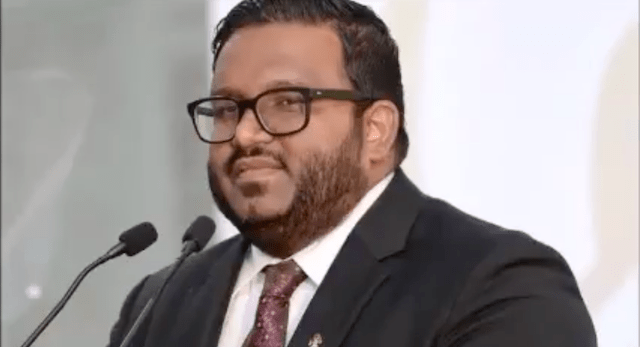 Police raids of houses belonging to Adeeb’s close associates while he was away, and the failure of the President’s Office to publicize his trip –which included a meeting with the Chinese President Xi Jinpeng – appeared ominous. Yameen addressed the nation the day after his deputy’s arrest, attempting to set the record straight on what he termed the “eventful” nature of his two-year presidency. Accusing his deputy of impeding the investigation into the blast and having amassed unwarranted influence over the police, Yameen confirmed that Malé’s antique rumor mill remains more reliable than any state institution. Sweeping changes have been brought to the police leadership, and the defense minister has been replaced. Conflicting forensic reports from the US, Saudi Arabian and Sri Lankan sleuths added to the confusion. Many Maldivians switched over from the usual Hindi dramas on Saturday night to watch police reveal a record haul of illegal weapons. Hand guns, rifles, grenades, and material to make improvised explosive devices (IEDs) were found 45 meters under the crystal clear waters of the Baa Atoll marine biosphere. Indeed, President Yameen’s hour long attempt to reassure the nation appeared more like an admission that he had lost control. During the address, Yameen felt compelled to discuss the arrest of his defense minister for conspiring to harm him last February, the impeachment of Adeeb’s predecessor Dr Mohamed Jameel Ahmed in July for disloyalty, and the controversial imprisonment of former President Nasheed on terrorism charges. Overwhelming international criticism of both Nasheed’s trial and the continued antics of the Supreme Court under Yameen have also made clear that judicial reform has yet to be tackled. Indeed, Nasheed’s prosecution appears to have served as a distraction from the basic law and order problems that precipitated his chaotic exit from office, with leaders like the home minister reductively blaming structural problems on individual opponents. Intense political polarization accompanying multiparty politics has allowed the issues to be dismissed as “political” in nature, stalling the full realization of the democratic constitution adopted seven years ago. After its inception, the newly-elected Nasheed had refused to pursue the traditional method of jailing politicians in order to forestall power grabs. While this strategy backfired spectacularly, it did point the way towards democratic politics free from the cycles of coup, conspiracy, and counterattack amongst the capital’s aristocracy. Many who balked at attempts to modernize the country’s justice system must now realize that this is a rising tide that could have lifted all boats. This article first appeared at the Himal Southasian, a leading magazine of Maldives. Click here to go to the original. One Bangladeshi analyst believes that political upheaval and government’s authoritarian actions in Maldives have caused rise of Islamic conservatism, a politically influenced judiciary, militarization of the police, close collaboration with China, and increasing harassment of migrant workers.